Isagenix IsaMove £ £13.00In stock! Order now! Do you want to support you metabolism, maximise protein function, and enjoy a leaner, healthier you? If so, IsaMove may be the solution you’ve been looking for. This all new magnesium-based supplement was developed to support normal energy-yielding metabolism and assist with several natural bodily functions, such as muscle function and protein synthesis. Each bottle contains 60 capsules. For more information about this product, download the product information guide here. Magnesium is a vital mineral that’s often overlooked. While we associate calcium with healthy bones and potassium with bananas, no one has yet to popularise an association with magnesium, making it less important on our list of must-have minerals. Magnesium is a critically important nutrient for the support of overall human health. It plays a key role in more than 300 natural chemical reactions within the body, helping to maintain energy levels, reduce stress, and sustain heart health. As a testament to its importance, several doctors, scientists, and nutritionists believe this underrated mineral is the most important nutrient for the human body. Unfortunately, most people don’t get enough magnesium. In fact, magnesium deficiency is one of the most common nutritional deficiencies for people throughout the Western World. Developed to solve this dilemma, IsaMove provides a healthy dose of magnesium and other vital nutrients to promote wellness and healthy body function. Magnesium deficiency can affect nearly every bodily system. Most notably, however, it affects the muscles and may lead to cramps, twitches, back aches, tension headaches, and muscle soreness. With continued magnesium deficiency, your central nervous system may be particularly affected and produce symptoms ranging from insomnia and restlessness to anxiety and panic attacks. Why is Protein Synthesis Important? In addition to the myriad of other benefits it provides, Isagenix IsaMove also helps with protein synthesis, which plays an important role in DNA replication, the transportation of molecules, and supporting a healthy metabolism. Without proper protein synthesis, the body cannot heal itself and the cells can’t grow or reproduce as needed. Isagenix IsaMove was developed to help your cells repair themselves and keep you healthy, moving, and feeling your best. With IsaMove, you can cut down on your post-workout recovery time in half and amp up your reps each and every day. 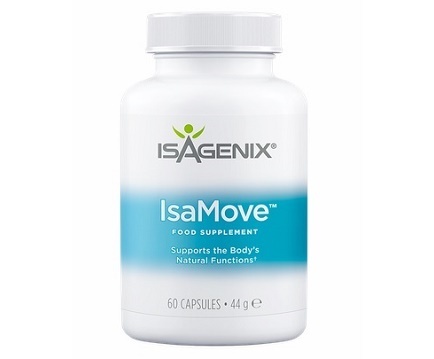 If you want to boost your metabolism, support your natural bodily functions, and get more out of every workout, IsaMove should be a must-have addition to your Isagenix arsenal. Isagenix IsaMove can be purchased for £20 per bottle at full retail prices, or sign up with us (UK’s #1 distributor) and pay just £15. Each bottle contains 60 capsules. Read Isagenix IsaMove reviews from real Isagenix UK customers!